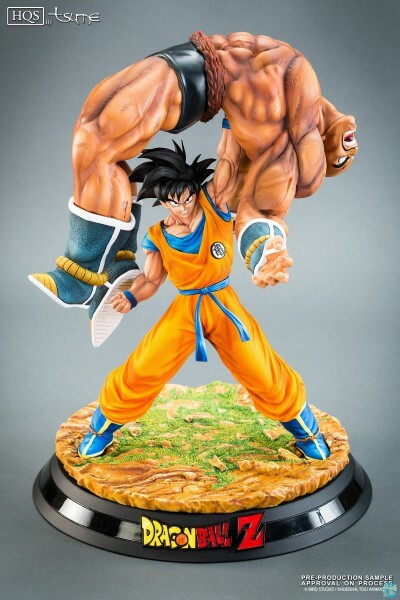 Produktinformationen "Dragonball Z - Goku vs Nappa HQS / The Quiet Wrath of Son Goku: Tsume"
Here is our second statue of the Saiyan Arc! After having reviewed the sacrifice of Piccolo in our previous HQS, we are now looking at another important scene of the fight against Nappa. As the Saiyan is about to strike Krilin and Son Gohan, Goku used the Kaio ken for the first time and breaks his ennemy's back. Our statue "The Quiet Wrath of Son Goku HQS by Tsume " shows the end of the fight, as Goku holds his opponent's body with one arm. The massive body of Nappa contrasts with the more slender shape of Goku. A complex paint job highlights the details of the sculpt like the weaving of Goku's clothes or the veins on Nappa's skin. Weiterführende Links zu "Dragonball Z - Goku vs Nappa HQS / The Quiet Wrath of Son Goku: Tsume"
Kundenbewertungen für "Dragonball Z - Goku vs Nappa HQS / The Quiet Wrath of Son Goku: Tsume"